JF-Stoll's FCT 1355 high capacity forage harvesters are now available from TR & KR Shipton Pty Ltd . They feature a strong but simple transmission and also a powerful feed intake. They require only minimal maintenance and few repairs. FCT 1355 forage harvesters have only 2 lubrication points on the big pick up. During inspection of the blade rotor the chute can be opened with one hand, due to a special relief spring. In addition, Knife sharpening is simple and safe. 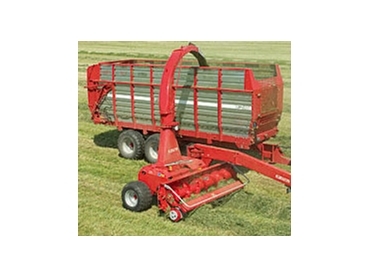 FCT 1355 forage harvesters feature a ground-breaking chopping rotor, called the Upper Cut system. It cuts the material at the shear bar and then throws it directly into the chute and out. They also have strong, wide chopping rotors with a 3.1 m wide pick-up. This working width enables them to pick up a swath in full width after a 3.2 m mower. They are also the only choppers on the market with a drawbar which enables operators to choose between working with the machine offset, semi offset or in-line with the tractor.